As with so many writers, life has been getting in the way of me writing much this year. 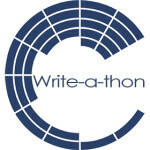 So I’ll start simple–write at least 1,000 words every week during the Write-a-thon. That sounds very modest, but this year, I have seen–life, life finds a way (to mess with my writing brain). My financial situation doesn’t allow me to make donations of my own right now, but I thank anyone who is able to do so!